This kit comes with one set BLOCK Copy-Change Sign Letters and 10 pieces of Flex Letter Track. The letter set consists of 299 black letters and red numbers. Block style letters is a bold font. These letters are wider than Condensed letter sets. These look NICE. Make you Sign stand out and easy to read. 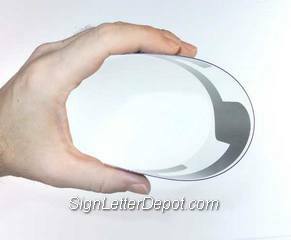 You can use this kit to replace any old or damaged sign letter tracking on you sign face or to make a new sign or reader board. With 10 pieces of track you can have a sign with 4 rows of letters on 2 sides a sign. The 7 foot 6 inch tracks can be used on 8 foot long sign face. This track is designed to use with .030 flexible plastic letters and is commonly called "Texas Track" or flex track. The 6 Inch Letters are printed on a 6 7/8" tall clear plastic flexible panel a about .030 mills thick or about the same thickness of a credit card. Changeable Copy-Change letters are very flexible. They bend or flex to insert into sign track. To attach drill a hole in the center of the polycarbonate flex track and anchor to sign board using rivets or screws. Don't forget to add some Nylon Rivets to mount tracks on sign panel. Pick some up HERE. 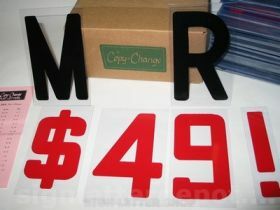 Note: These Flex letters are not recomended signs with letters behind enclosure doors, vandal or wind covers. Refer to DR Acrylic Flex Letters for enclosed signs . Telescoping Sign Letter Changing Arms are used for overhead signs with "Push Up Drop Down Tracking" which use Gemini Rigid Letters, Zip Change Rigid Letters or Rigid Marquee Letters. Choose Push Up Drop Down Track and Rigid, Pronto or Zip Letters If you want to make or re-track an overhead sign and use a sign letter changing pole to change the signs letters.